UCCFS: Meatloaf vs Enchiladas Round 1 – I Love It Spicy! The Ultimate Chilehead Comfort Food Showdown continues on with another 4 seed, Meatloaf trying to tackle 13 seed Enchiladas. When people refer to comfort food, they often think of something homemade, and meatloaf is one of those type of meals. I for one was scared at my Mom’s creepy creation as it moved across our dining table, but for many this meaty offering brings warm memories of dinner at home. In today’s world, meatloaf has changed to be more than just beef and sauce in a casserole dish. There are so many variations with vegetables, cheese and other forms of meat, even the sauce varies from loaf to loaf. Enchiladas is quite versatile as well. 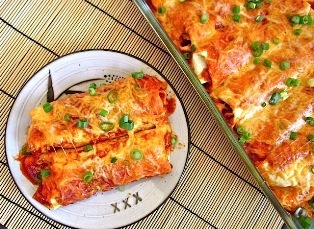 There really is no atypical enchilada as the soft tortillas are stuffed with a variety of meat, cheese and veggies and the sauce can be red, green or cheesy. On top, cheese is customary as it is usually melted above the sauce. This Mexican food is just as popular to some as the tacos are, and perhaps a favorite in New Mexico where the popularity of red and green sauce is most prevalent. Depending on how you were raised, a good enchilada can go toe to toe against the best of meatloaf, but that is for you to decide. Which is your favorite? If you have a story to tell, please explain why you came about your decision. I am still having flashbacks of my Mom’s. I would think with all the sauces you have at your disposal, that you would still use ketchup. Have you ever strayed away from the traditional and used something spicy or teriyaki or jerk style for example? 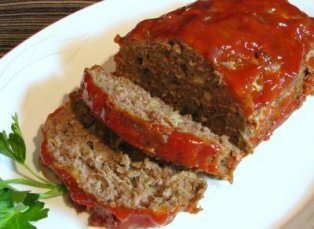 I used Three Hot Tamales “Cry Baby” a few years back and it was my first attempt at meatloaf and it rocked. As a comfort food, for me its enchiladas. but only the green. I will take meatloaf over reds. This is a great battle so far. Almost a full day of voting in the books are we are tied 11-11. I’m a veal, pork and bison man myself…..
Man, I love them both but nothing beats some good old Mexican food! Come on ‘ladas! Allow these ingredients to meld together, before adding them to the hamburger mixture. (optional) top with tomato sauce, or chili sauce. Bake at 350 degrees-1 hr. or until you stick silver knife into center & no juice with blood comes out. Enjoy: this can be adjusted to taste Hope you enjoy this.